Some people have the idea that vintage pens are boring and are usually just plain black hard rubber. Not this one! 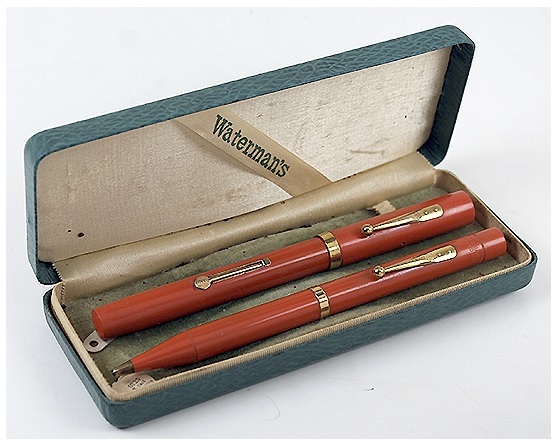 Here is a 1925 Waterman 52 lever-filler set in Cardinal Hard Rubber. What a great color! Very rare – especially in this condition! Extra-fine, flexible, italic nib. New-old-stock. Except for a slight shade difference where the barrel was covered by the cap, mint in original box. Not only is it a great color, the condition is great, and the nib is fantastic. Found in Catalog #74. This specimen is no longer available, but check out our other Catalogs for more great pens! This entry was posted in Vintage Pens and tagged Extraordinary Pens, Waterman. Bookmark the permalink. Follow any comments here with the RSS feed for this post. Post a comment or leave a trackback: Trackback URL.